History: Cherry and her 11 siblings were just going through the training phase. Cherry is the “L” dog in the litter. Cherry and her littermate, Nina, were deemed not to be racing material and came to TAGS together. 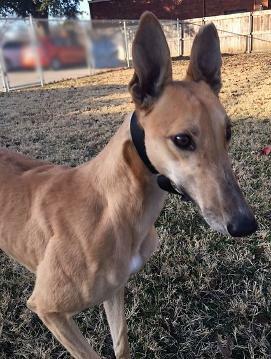 (Dam, Driven Tempo and Sire, Crown and Crest) Cherry is a petite fawn dog with a very sweet face. She is friendly and is an energetic 18-month old. 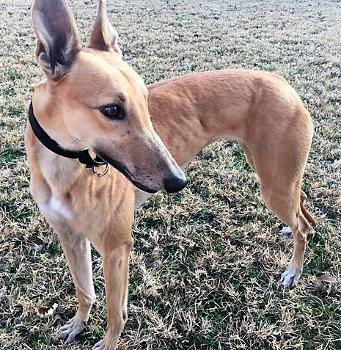 She has mule ears (ones that stand straight up – with a nick out of one of them). She had quite a busy day on her first day off the farm. She rode extremely well in the car and slept all the way to Dallas. She was not fond of getting a bath; but like most new greys, soon yielded to the warm water and massaging. She makes good eye contact and responds to attention. We hope she will enjoy her new adventure. 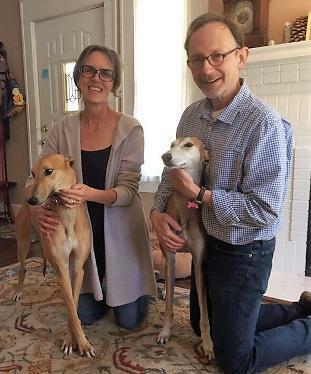 Cherry with her new family, Susan, John and Greyhound sibling, Doe. 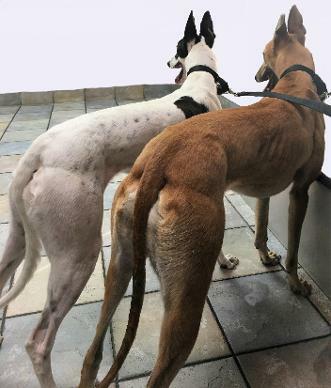 December 21, 2018 update: Cherry found her forever home with a greyhound sibling, Doe. Congrats to all! 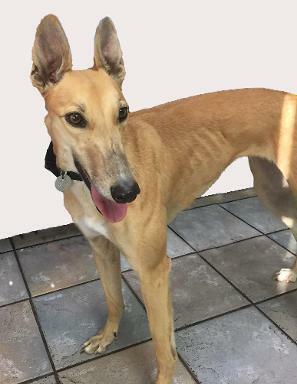 December 3, 2018 update: Cherry came to TAGS for a life of retirement and to find her loving lifetime home.